K9 Flash is Named the 2018 Law Enforcement Dog of the Year! Flash, a retired K9 officer and Project K-9 Hero ambassador, has been named a finalist for the 2018 American Humane Hero Dog Award. The annual, nationwide contest honors “ordinary dogs who do extraordinary things,” according to the Hero Dog Awards website. K9 Flash’s charity partner is K9s4COPs. 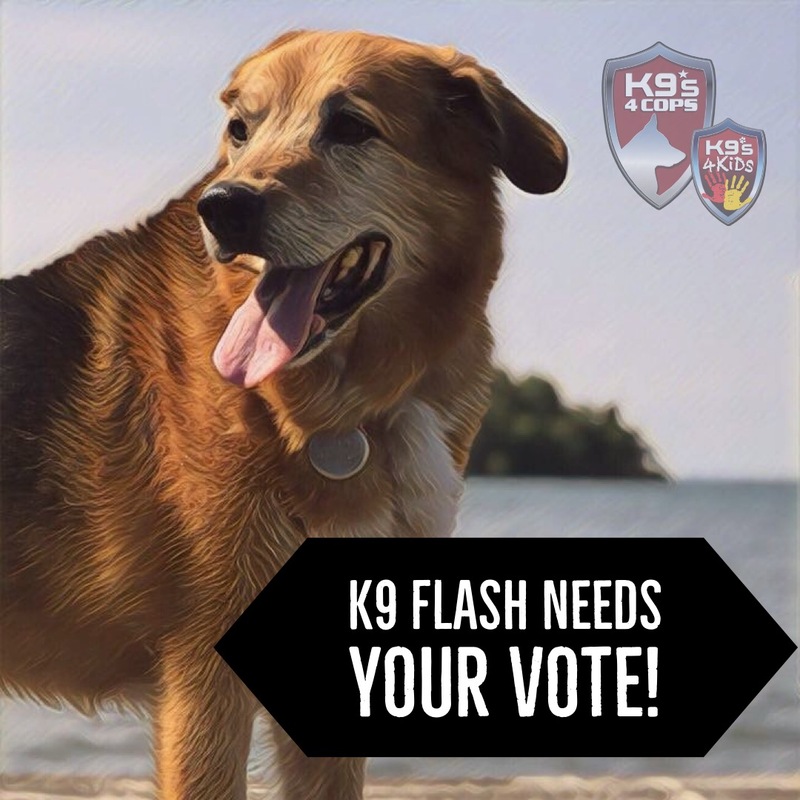 WE NEED YOUR HELP TO VOTE EVERYDAY FOR K9 FLASH! You can vote once per day through September, 5th to help K9s4COPs win $7,500! K-9 Flash went from a shelter puppy, deemed unadoptable, to becoming a successful Narcotics Detection Police K-9 with over 3,000 deployments and 2200 narcotic related finds and seizures in her career. After serving from 2005-2013 with the Yakima, WA Police Department Flash retired once again needing a home. Her original handler and trainer, Jason Johnson, got the opportunity to adopt her after he had left for federal service and was teaching K-9 courses in Virginia. Flash then inspired Jason to start a national non-profit, Project K-9 Hero, to help other retired Police K-9 and Military Working Dog Heroes with medical care, food, and death benefit assistance once they are no longer covered by the agencies they serve. Their foundation has helped over 30 retired heroes with medical costs and they have another 45 in waiting for financial assistance. 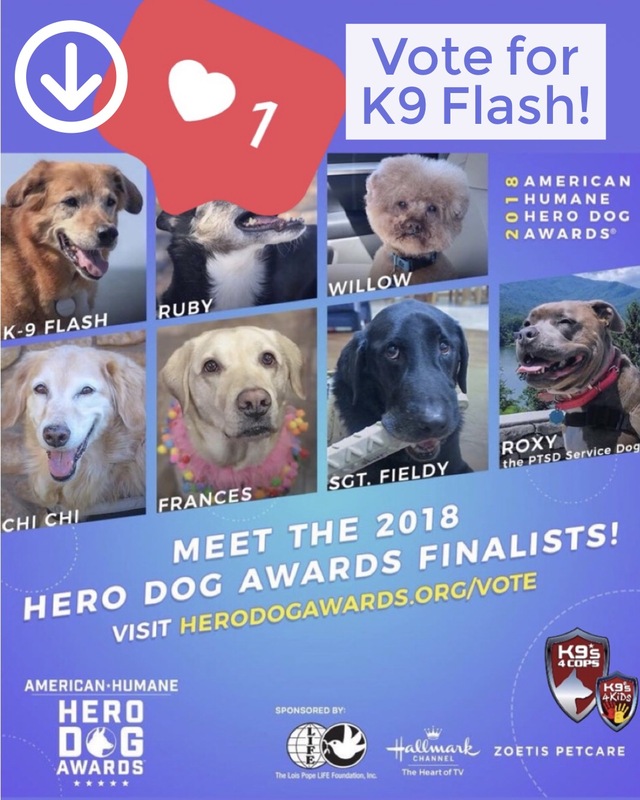 There are seven categories and the K9 with the top votes in each category will be flown to Hollywood, California with their owner. They will attend the American Humane Hero Dog Awards gala on September 29th where the winning K9 will be announced live. The gala will be broadcasted on the Hallmark Channel in the fall. Each 2018 Hero Dog Awards Finalist receives $2,500 for their charity partner, donated by American Humane. K9s4COPs is excited to have the support from Project K-9 Hero, K9 Flash, American Humane, and many others. The American Hero Dog will win an additional $5,000 for their charity partner. K9s4COPs wants you to nominate your K9 for the AKC Humane Fund Award for Canine Excellence. Click the link below to read about the award and for the application to nominate your K9. Nominations will be accepted through July 31, 2018. Don’t forget to submit a photo to communications@akc.org after completing the application. Please let me know if you have any questions and I would be happy to help (kortney@k9s4cops.org). We have some PAW-SOME news! Two K9 semifinalists in the American Humane Hero Dog Awards have chosen K9s4COPs to be their charity partner. You can vote for K9 Odin and K9 Flash each day through July 11, 2018 to help us win up to $7,500! Please vote for these PAW-SOME K9s every day until July 11, 2018! We just got in these adorable K9s4COPs PopSockets! Even our mini K9 wants one! 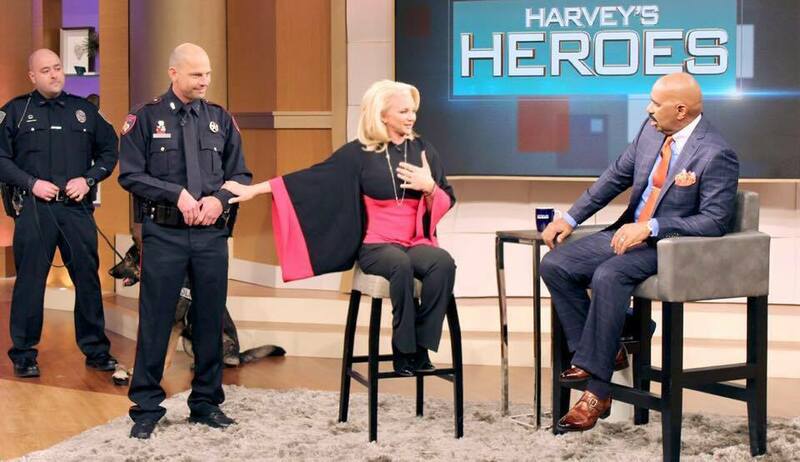 K9s4COPs Founder, Kristi Schiller, receives the honor of being named a “Harvey’s Hero” on Thursday’s episode of the ‘Steve Harvey Show’. Little did Schiller know, there were nine K9 teams from across the country that were coming to surprise her and thank her for starting the organization that enabled them to get their K9 partner. Between the tears, barking and laughter, Schiller explains her inspiration for K9s4COPs (Spoiler alert: He surprises her, too.) how K9s4COPs has grown, the impact they have had in your communities, and how you can help out! Check out www.SteveHarveyTV.com/watch to find channel availability and air time in your area.